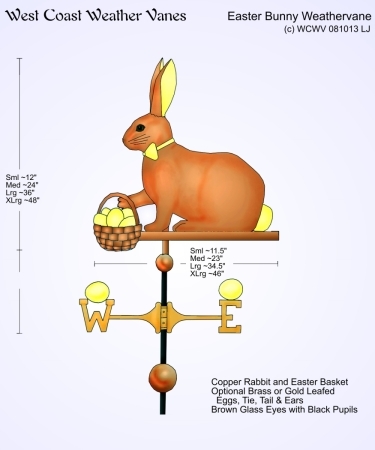 The Rabbit Holding Carrot Weather Vane, as shown here, was made in copper with brass and optional gold leafed accents. 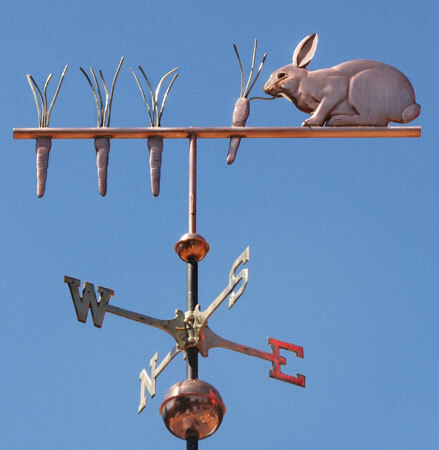 The rabbit’s body, the frond-like tops of the carrots and the horizontal tube representing the ground are done in copper. 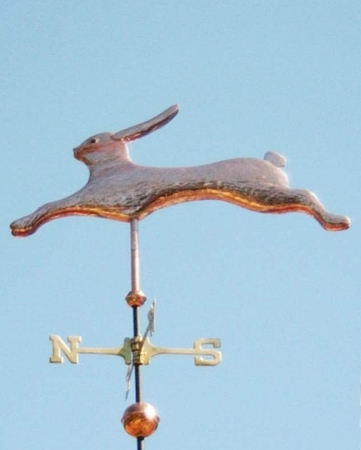 The rabbit’s ears are brass, creating a slight variation in color as the weathervane goes through the patina process. The carrots themselves and the rabbit’s cottontail were gilded with optional gold leaf and will stay a light golden color as the copper and brass darken. The rabbit also has brown glass eyes with black pupils to give it an alert and lifelike appearance. 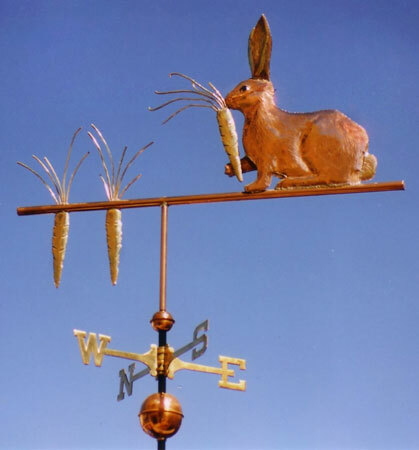 Many years ago, when we were just getting started in this profession, we showed our weathervanes at art and garden shows. 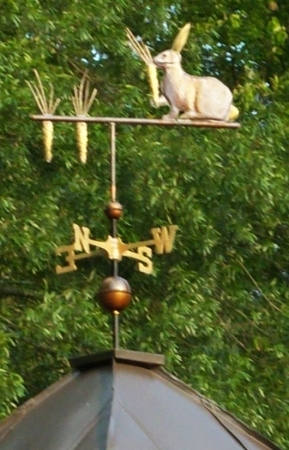 Especially at the garden shows, this weathervane design was very popular. We have made many versions of this design for display in garden settings, on top of gazebos, greenhouses and garden sheds. 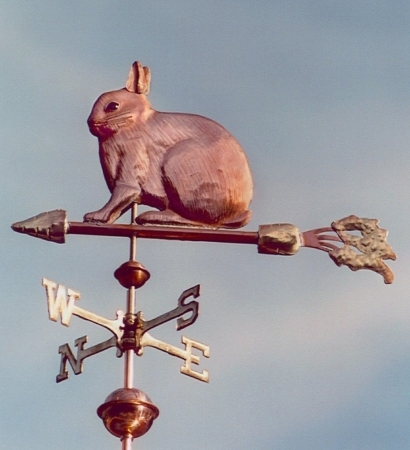 With the advent of the internet we stopped doing shows and reached other audiences around the country who had additional ideas on where to put their rabbit weathervanes, including rooftops, garages and rabbit hutches..
As with other of our animal designs, our rabbit weathervanes are popular with customers whose names are in some way associated with rabbits. ‘Bunny’ as a first name and the surnames ‘Hare’, ‘Lapin’ from the old French word lapriel and ‘Coney’ are examples we’ve encountered over the years. 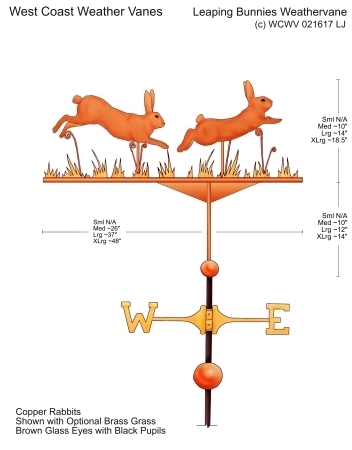 We made two extra-large rabbit weathervanes for ‘Bunnies by the Bay’, the beloved children’s store, headquartered in Anacortes, Washington. 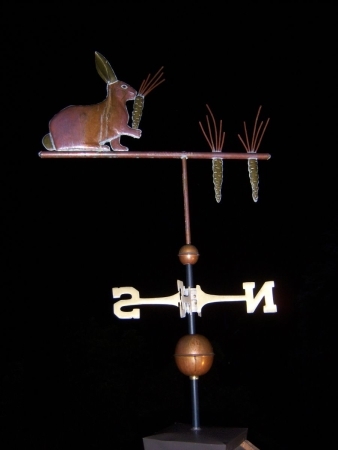 Rabbit Weathervanes are also popular birthday gifts for people born in the Year of the Rabbit. According to the Chinese Zodiac these years are 1924, 1936, 1948, 1960, 1972, 1984, 1996, and 2008.